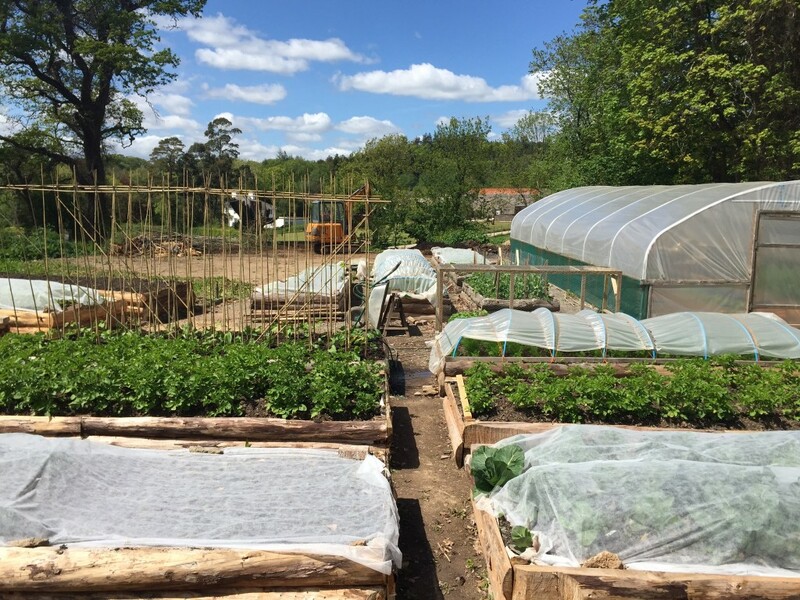 This year has seen the beginning of a market gardening enterprise at LandWorks, headed up by Project Team Leader, Mark Mitchell. As it flourishes, Mark talks about his experiences, lessons learned and plans to expand further. Those of you who have visited Quarry Field over the last few months will have seen that we have started a small vegetable enterprise. Most of the produce is sold at our Quarry Field Gate. 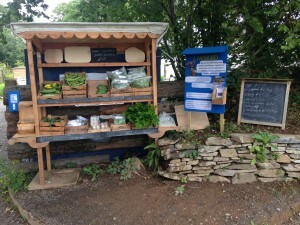 We also make regular trips into Totnes to sell produce to cafes and market stall holders and whenever Schumacher College needs some extra salad we try to provide it. Knowledge gained from my early working years as a farmworker/herdsman has proved sufficient to help start this enterprise and produce vegetables that we hope are of good quality and that people enjoy. Gradually lads who I was worried would not be interested at all have started to ask me about kohlrabi and suggest where we should plant the next pak choi! I know that I have had some of the most thought provoking conversations I have ever had whilst hoeing the lettuces at LandWorks. We have learnt a lot this year: about what people like, how to improve continuity, what quantities work well and so on. For example we thought we had planted enough new potatoes to last for a month but they sold out within four days! Lesson learned. The market stall has proved really popular and we don’t think this is just because people enjoy our produce (although we have been told that LandWorks vegetables have made it into the sermon at Tigely Cross Church!). We have a mystery customer who in exchange for half a dozen eggs has been putting £12 in our honesty box (whoever you are, thank you). We hope it is because people want to support the guys, support the project and be involved. If you stop by for some veg, you’re quite likely to find one of the guys replenishing the stock, sorting packaging or chatting to customers. Everything LandWorks does is about helping people to feel part of something, to feel included. This engagement with the community is great, and vital. So, next time you are passing, please do come and say hello. You’ll find the stall at the entrance to our Quarry Field site, which is about 400m up on the right after you enter the Dartington estate by the church. Probably most important of all is the opportunity that the veg growing gives for time to chat. I sincerely hope that some of the people I have worked with have at the very least benefited from the fact that someone is genuinely interested in their stories and their futures. I personally know that I have had some of the most thought provoking conversations I have ever had whilst hoeing the lettuces at LandWorks. We have a busy year ahead, with plans to expand the vegetable enterprise further. We are working on a funding application that, if successful, would enable us to expand to field-scale vegetable growing. Not only will this mean more veg and more income for the project, but crucially, in time, it will provide an employment opportunity for our graduates. We will require match-funding too so if this project sounds like something you would like to support, please get in touch.